Rubber Room Ramblings: CUPCAKES AND CIRCLES! As promised, here's another Build a Cupcake Punch card! I not only used the Build a Cupcake Punch for this card, but I added some dimension to it with some punched circles! I love the Stampin' Up! circle punches, and they layer so nicely with one another. Sticking a cupcake on them just seemed like the right thing to do. The awesome Stampin' Up! 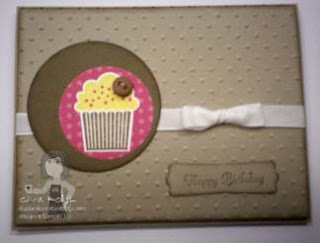 punches make this a very quick and easy card! Be sure to check out all the Stampin' Up! punches on pages 200-203 of the 2010-2011 Idea Book and Catalog!